The Breeze iOS app by RunKeeper is amazing and very disruptive towards the personal pedometer / intelligent fitness tracker space within wearables. I’ve looked at FitBit and other devices many times. My wife has tried several similar products. I’ve been more partial to Suunto or Polar heart rate monitors than I have been to pedometer and activity tracking events. With Breeze there is no new hardware. I just downloaded the iOS app and the software is able to make use of the chipset and sensors that are standard on iPhone 5s. Not having to get new physical hardware, with all of its charging and other needs, is a huge advantage. Your iPhone’s hardware already has this data on you and keeps it on a rolling 7 day basis. 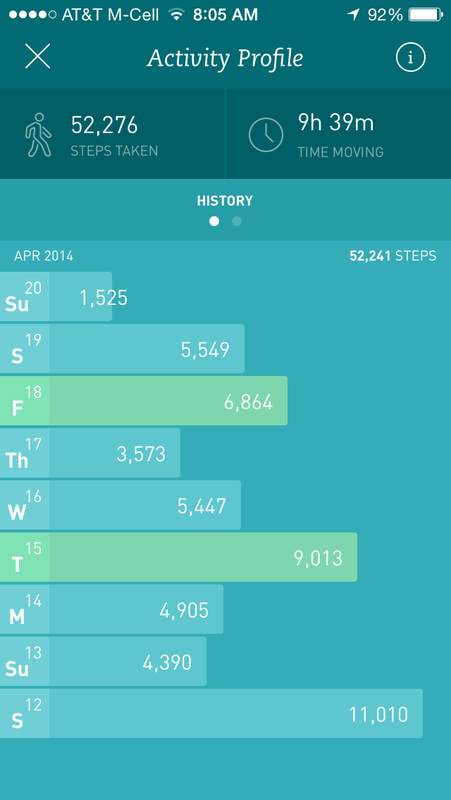 When you first load up Breeze, it starts with your last seven days of activity right away. That FitBit you ordered by mail can’t do this – no other hardware product can do this. You’ve been carrying the device with you already, the software simply unlocks new potential. The app loaded with seven days of history; this just isn’t possible with newly purchased hardware – user feedback arrives right away. When I get to work, the iPhone goes into a charger near my PC. There’s a similar storage spot at home. Not anymore though – putting the device down prevents me from getting credit for all of those steps. This is particularly true if I’m working at a standing desk (which may or may not count). This is the first time I’ve had an app that makes me want to be sure that the phone is always physically on me – that’s something Apple will want to promote and encourage, even if it is a bit creepy. The basic app now is free. Premium services make a lot of sense and can go in many, many previously explored directions. Sharing? Exercise recommendations? Scoreboard for you and your peers? All of these have potential as add-on features that could command premium pricing. If I’m FitBit or another similar physical product maker, the need to have an app in this space right away is big. This is a large user base (iOS with iPhone 5s and future releases) with reverse compatibility into their device who now have no reason to buy one of your devices. Congratulations to the team at RunKeeper for releasing a good app quickly that makes use of the hardware’s capabilities. This entry was posted in Business, Disruption and tagged App, App Store, Apps, Big data, Data, Fitness, Fitness Tracker, iOS. Bookmark the permalink.